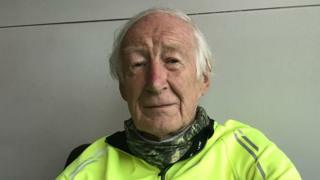 Image caption Laurence Brophy says his trip is "nothing adventurous really"
An 86-year-old man hopes to become the oldest person to cycle from Land's End to John O'Groats. Laurence Brophy will begin by first cycling from his home in Pencoed, Bridgend, to Cornwall, on Sunday. He will then continue his three-week, 1,800-mile round-trip on Monday. He does not plan to carry supplies - he will "just stop at Tesco Express". Tony Rathbone holds the current Guinness World Record for completing the journey in 2014, aged 81. "I'm not a fast rider but I want to put the hours in at a steady pace," said Mr Brophy, a former marathon runner. "I'm going to sleep rough whenever I can, bedding down whenever I get tired or when I think I've done enough for the day." Mr Brophy is cycling to raise awareness of the University of the Third Age - a movement which brings together people who have finished working full-time or raising a family. He realised in his 60s he had to do something to keep fit and started jogging. "Then it was a London marathon and then I began to do desert marathons," he said. "Now I can't afford such expensive adventures, so I'm walking and cycling. "I think what I'm addicted to is the months of preparation, planning. The event itself is maybe a bit of an anticlimax. I shall just roll along steadily.